In a key AFC East showdown, the Miami Dolphins had an 8-3 record and were trying to catch the Baltimore Colts, the team they hosted on December 5, 1977. Under Head Coach Don Shula for the eighth season, the Dolphins were retooling after dipping to 6-8 in ’76. QB Bob Griese was still outstanding behind center, but behind him in the backfield were rookie FB Leroy Harris and second-year HB Gary Davis, who had both started out the season as reserves. The defense had undergone the bigger transformation, with five rookies starting and performing capably. Miami had been beaten badly at Baltimore in the season’s fourth week, but surrendered more than twenty points in a game only once since then. Baltimore was coached by Ted Marchibroda and, at 9-2, was seeking to top the division for the third straight year. QB Bert Jones had a powerful and accurate passing arm and HB Lydell Mitchell was highly productive as a runner and pass receiver while the defensive line was adept at rushing opposing quarterbacks. The club had lost at Denver the previous week after winning four straight. There were 68,977 fans in attendance for the Monday night game at the Orange Bowl. The Colts had first possession, punted, and Miami drove 69 yards in 11 plays. Leroy Harris started off with two carries for seven yards and, after an offside penalty gave the Dolphins a first down, Gary Davis and Harris picked up another 14 yards between them. The big play came on a pass from Bob Griese to WR Nat Moore for a pickup of 41 yards to the Baltimore 11. Miami couldn’t reach the end zone from there but scored first when Garo Yepremian kicked a 27-yard field goal. 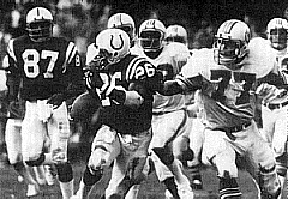 The teams traded punts, but the Colts got a break when the kick by Mike Michel of the Dolphins traveled only 22 yards to give Baltimore possession at the Miami 36. Lydell Mitchell ran twice for 12 yards and caught a pass from Bert Jones for eight more. The drive stalled at the 15 and Toni Linhart tied the score with a field goal from 32 yards. The Colts regained possession shortly thereafter when, on the second play after the kickoff, a Griese pass intended for TE Andre Tillman bounced off the receiver’s hands and was intercepted by LB Tom McCleod, who returned it 33 yards to the Miami 12. Following a three-yard run by Mitchell, Jones threw two incomplete passes, the second of which was dropped by TE Raymond Chester, and the visitors settled for a 27-yard Linhart field goal that nevertheless put them in front by 6-3. As the game moved into the second quarter, the Dolphins responded with a 49-yard drive in just four plays. Griese threw to Moore for seven yards on first down, Harris ran for 15 yards, and Griese went to the air again, completing to Davis for 12 more. A Griese scramble was nullified by a penalty, but he then passed to Tillman, who ran through two defenders for a 15-yard touchdown. Yepremian added the extra point and the home team was ahead by 10-6. The Colts turned the ball over on the next series when FB Ron Lee fumbled at midfield after being hit by CB Norris Thomas. 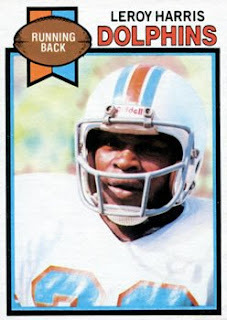 It looked promising for the Dolphins as Griese threw to WR Duriel Harris for 10 yards, completed a short toss to Moore for four, and then Leroy Harris gained 11 yards around end. But after getting inside the Baltimore 10, Davis fumbled and CB Nelson Munsey recovered for the Colts. Baltimore was forced to punt from its own territory and a 17-yard return by WR Freddie Solomon had the Dolphins starting their next series from the 50. They advanced to the Baltimore 11, primarily thanks to a Griese completion to Duriel Harris for 21 yards, but Yepremian missed a 29-yard try for a field goal. The score remained unchanged at the half. The teams exchanged punts to start the third quarter until the Colts, starting from their 34, put together a promising drive. Jones completed all four of his passes and Mitchell and FB Don McCauley handled the running load. But with first-and-goal at the Miami four, FB Roosevelt Leaks fumbled into the end zone and Thomas recovered for the Dolphins to end the threat. The Dolphins were driving as the game entered the fourth quarter. Griese made good on four passes, the longest to Moore for 18 yards on a third-and-22 play that put the ball on the Baltimore 31. However, Yepremian was short on a 49-yard field goal attempt and the home team continued to cling to a four-point lead. The Colts reached the Miami 49 before having to punt again. With the ball at their 23, the Dolphins made the biggest play of the game on first down when Leroy Harris carried to his right and headed down the sideline before cutting back to the middle and going the distance for a 77-yard touchdown. It was the longest scoring run in franchise history at the time and, with Yepremian’s kick, the Dolphins had an 11-point lead with 7:42 remaining to play. Jones went to the air on every play in response. He connected with WR Roger Carr for 22 yards on a third-and-10 play and picked up another first down with a screen pass to McCauley for 13. But the series stalled at the Baltimore 45 and the Colts punted. Miami managed to run the clock down on the ensuing possession, with Harris and Davis running effectively and picking up two first downs. The Dolphins finally had to punt from their 40, but Baltimore had only a minute to work with and the Colts were starting from their 24. Jones completed three straight passes, two of them to McCauley, to get to the Miami 44, but a bomb intended for Doughty was incomplete and, on the game’s final play, a pass to Chester gained 29 yards. Miami came away with a 17-6 win. The Dolphins had the edge in total yards (352 to 311) while the teams were even in first downs with 17 apiece. Of Miami’s yardage total, 207 came on the ground. The clubs were also even with two turnovers each while the Miami defense forced the Colts to punt seven times. Including the long scoring carry, Leroy Harris rushed for 140 yards on 17 attempts. Gary Davis also was productive with 56 yards on 12 carries. Bob Griese completed 13 of 22 passes for 170 yards and a touchdown along with an interception. Nat Moore topped the Miami receivers with 5 catches for 83 yards. For the Colts, Bert Jones was successful on 18 of 34 throws for 189 yards with no TDs but also none intercepted. Lydell Mitchell (pictured below) rushed for 84 yards on 20 attempts and caught 6 passes for another 62 yards. Don McCauley, who gained a modest 14 yards on the ground, also had 6 receptions, for 51 yards. Only four of Jones’ completions were to wide receivers. The win put the Dolphins in a tie for first in the AFC East with Baltimore but they lost the following week and, while the Colts did also, the teams both ended up at 10-4. Baltimore won the division title due to a better record in the conference and Miami finished second and, with only one wild card spot available at that time (a second would be added the next year), out of the postseason. Oakland, with an 11-3 record, was the wild card participant and defeated the Colts in a Divisional round overtime thriller. The 140-yard rushing performance ended up being the career best for Leroy Harris, who rushed for 417 yards on 91 carries (4.6 avg.) 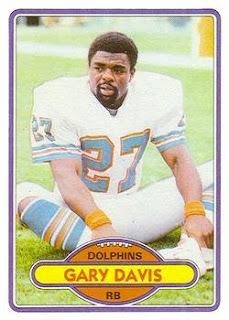 and four touchdowns in 1977 and would go on to play a total of five seasons with the Dolphins and Eagles. Gary Davis gained 533 yards on 126 attempts (4.2 avg. ), which was his highest yardage total over the course of six years in the NFL.